Martin Luther, with concern to the state of the Church and the Papacy with regards to the Power of Indulgences, did according to legend nail these Theses to the Church in Wittenberg. 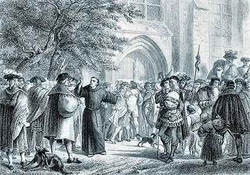 In 1517 Luther wrote to Albrecht protesting the sales of indulgences and the abuse of the poor that these sales necessarily caused. Johann Tetzel, under the authority of Pope Leo X, began selling these indulgences in German Provinces for the renovation of St. Peter's Basilica. These protests are often considered a major catalyst for the Protestant Reformation. Withing two weeks, after having been translated from Latin, these protests had been circulated throughout Germany and by 1519 most of Europe including France, England, and Italy.